North Carolina's blowout of Duke wasn't the most pressing blowout on the college basketball powerhouse's mind after Wednesday's marquee matchup. Instead, it was Zion Williamson's blown-out Nike high-tops. Williamson, who is projected by many to be the first overall pick in this June's NBA draft, left Wednesday's game with a right knee injury and his shoe tore in the opening seconds of the game. He did not return and the Tar Heels went on to an easy victory over the No. 1-ranked Blue Devils, 88-72. "We're very concerned about Zion," Duke basketball coach Mike Krzyzewski said after the loss. "It's a mild knee sprain. We will know about length of time tomorrow. It's stable. Obviously it has an impact. You lose the National Player of the Year on the first play." More pressingly on some fans' minds was how his shoe could tear apart, resulting in the injury. The sole could be seen torn completely off with Williamson's socked foot hanging outside. 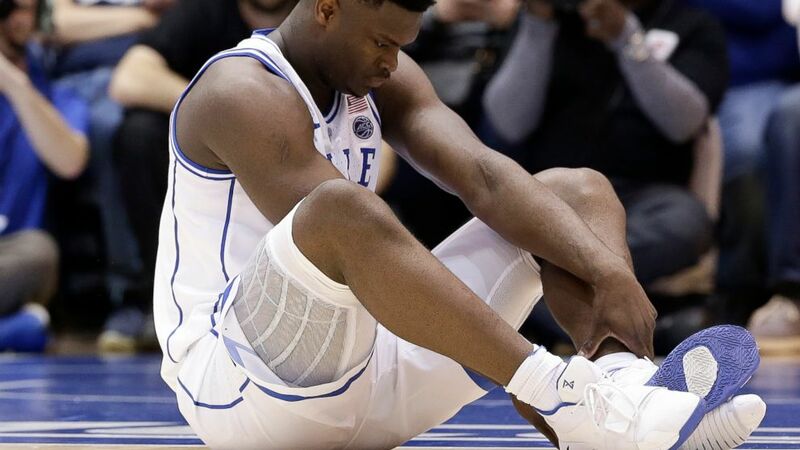 (AP) Duke's Zion Williamson (1) falls to the floor with an injury while chasing the ball with North Carolina's Luke Maye (32) during the first half of an NCAA college basketball game in Durham, N.C., Wednesday, Feb. 20, 2019. Nike apologized and promised an investigation after the game. Duke signed a 12-year deal with Nike to provide shoes and apparel for the basketball program. They are in the fourth year of that deal, according to ESPN. 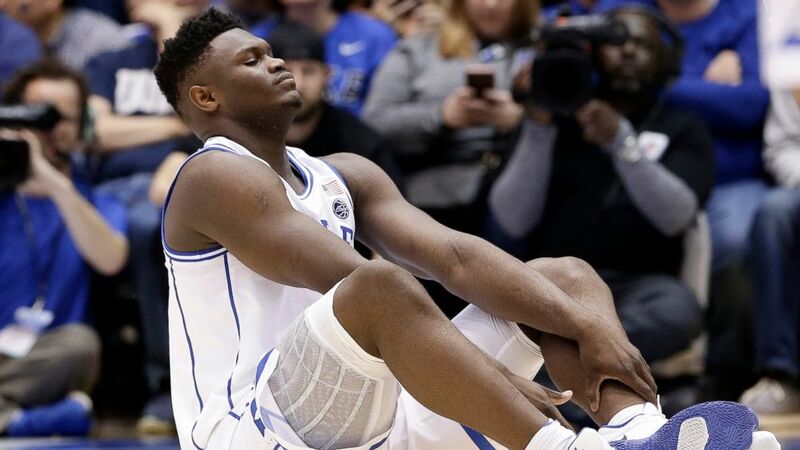 (AP) Duke's Zion Williamson sits on the floor following a injury during the first half of an NCAA college basketball game against North Carolina in Durham, N.C., Wednesday, Feb. 20, 2019. Williamson was able to walk off the court with only a slight limp. "I just thought he'd twisted his ankle or his knee," Duke's Tre Jones said after the game. "But when he took his shoes off, I thought maybe something else was going on." The game was maybe the biggest draw in years. Duke and North Carolina, with 11 NCAA championships between them, already have a decades-long rivalry, but the highlight-reel regular Williamson added even more attention. His teammate, R.J. Barrett, is also expected to be a top 3 pick in the NBA draft. ESPN reported ahead of the game that the cheapest ticket available in Cameron Indoor Stadium in Durham, North Carolina, was $2,500. One ticket sold for over $10,000. Former President Barack Obama, who was at the game, could actually be seen encouraging the star after his injury and tweeted his best wishes following the loss. Other marquee names in attendance included Oscar-nominee Spike Lee, Baseball Hall of Famer Ken Griffey Jr., NFL running back Todd Gurley and actress Hayden Panettiere.